To create this watch, Sinn built on the extremely popular design of the Sinn 857 UTC but removed the UTC complication - the result is a brand new watch called the Sinn 857 (Non UTC) on a fully Tegimented bracelet. Standard steel used by most watch companies has a hardness of between 200 and 240 HV (Hardness Vickers is a common scale used to measure material hardness). The Tegiment layer on this watch has a hardness of 1,200 Vickers which is six times harder than standard steel. The case features a copper sulphate capsule which reacts with moisture to diffuse and absorb humidity in the watch. This capsule may be viewed through a porthole in the left lug, and over time will turn a deep blue as humidity is absorbed. This technology not only provides a more stable environment for the movement, but also helps to prevent fogging of the crystal when going from hot to cold environments or from humid to non-humid conditions (such air conditioned buildings). Sapphire crystal with luminous hands, hour markers and the 12. Watch is water resistant to 20 ATM. 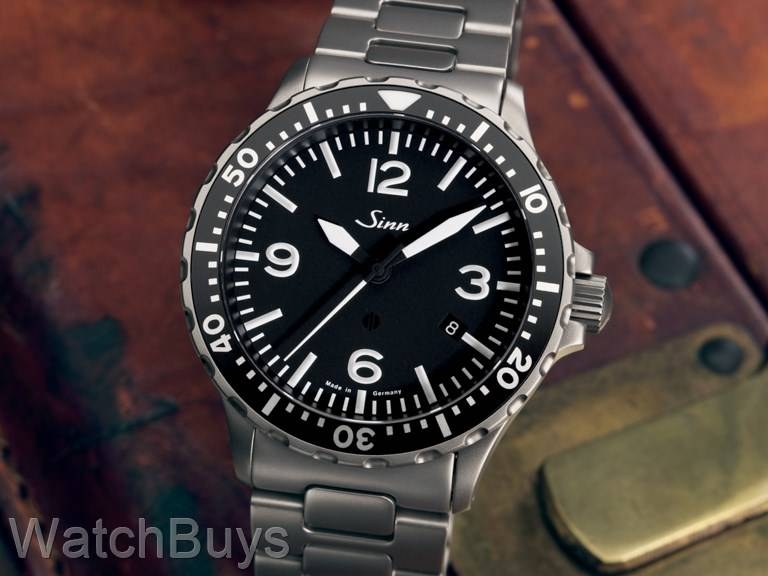 Watch is fitted with a Sinn stainless steel bracelet which is fully Tegimented and features a folding clasp. Verified Owner Comments: This watch is very simple, and it's simplicity fits with everything other than formal clothing. The more I wear it the more I appreciate the simple looks. The tengimented steel has held up well through several bangs. I have noticed the watch goes faster - 10 seconds everyday, which is more than I thought it would be. Verified Owner Comments: So glad I got this. From the features to the finish it's exactly what I wanted in a timepiece. I feel unstoppable wearing this. Customer service from WatchBuys was top notch too. "Understated, and finely engineered, well satisfied"
Verified Owner Comments: This is my first mechanical watch. I’m so pleased with my purchase. I’m became obsessed with learning for about 90 days. I’m an engineer and a detail nerd. Sinn became my brand of choice. 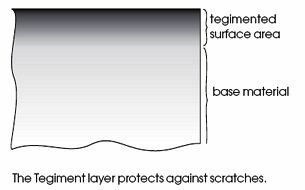 I considered so many topics, from AR coating(s), how it will fit under my shirt sleeve. Finally I took the plunge and when it arrived I was so thankful I chose this one. The fit & finish are, exactly as I hoped. Understated, and well engineered. Verified Owner Comments: This is my first Sinn, and I had my eye on it for many months before finally making the purchase. When it arrived I was not disappointed. The quality is excellent and it has rarely left my wrist in the last month. It has everything you'd expect from a piece in this price range, and nothing you don't need. The simple, uncluttered dial was what sold me on this watch from the beginning. The date window tucked neatly in at 4:00 is a nice touch and doesn't detract from the cleanliness of the dial. I think the proportions of the case are perfect, especially with its relatively short lugs. The 857 is now the favorite in my collection. Also, a note on the great customer service from WatchBuys; I received a call shortly after placing my order online confirming my order and explaining their policies as it was my first purchase. I'm looking forward to making my second purchase which will almost definitely be another Sinn! Verified Owner Comments: I live in Canada. Importing this watch from WatchBuys was a smooth process. A nicely crafted timepiece which has a real presence on my wrist. The dial is clean and extremely readable thanks to the bold white marking on a matte black background. The lume is bright and lasts when fully charged. The AR coating is on both sides of the sapphire crystal making the crystal seemingly transparent. The bracelet is very comfortable and solid feeling. The watch has been worn daily in the few weeks since I received it and is keeping about + 4 seconds a day - excellent. A great, quality timepiece for daily wear without the worry of scratching thanks to the tegimenting process. The only thing I would hope Sinn can improve upon is the very tight clasp - very secure but takes some effort to undo. Verified Owner Comments: Everything you need and nothing you don't - plenty of water resistance, best bracelet I've used, antimagnetic to an extreme, fully tegimented, clean dial, perfect height and width, firm, bidirectional bezel and all the cool anti moisture technology. Super functional and practical. 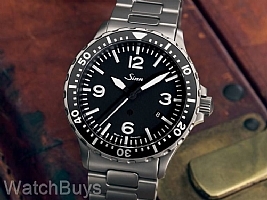 Possibly the most underrated Sinn out there. Verified Owner Comments: What is there not to like about his watch? Well, really nothing. The size of the watch is perfect, not too big and not too small. It easily fits under a shirt cuff. The face is legible and it is as water resistant as any recreational diver needs. You can wear the watch with jeans or a suit which leads me to the best part. The tegimented steel is very difficult to scratch. Gone are the days of putting on a G-shock because you may scratch your nice watch while you do something around the house, this Sinn can take it. All of those stupid ways you scratched you watch by pulling something out of the washing machine, striking it on the frame of a door or somebody hitting you with a bag in the airport are now behind you. This watch can take a beating and not only keep ticking but it remains pristine as well. As I said, what is here not to like? Verified Owner Comments: I had a Sinn 656 prior to this, which I loved. Moved 'up' to the 856 for the larger size and tegimented case just over a year ago. This watch is worn daily, not with kid gloves, yet I am yet to see a scratch on the glass or case. Personally, I love the simple elegance of it's design and superb durability. Verified Owner Comments: Received this watch on a Saturday just as expected. The color is more of a gun metal which was a little darker then the photos depicted. But to be honest, it has really grown on me. The bright stainless steel is very common but this definitely has its own appearance. The numbers on the face are clear and the build quality of the case is absolutely fantastic. I was tired of the business of the chrono face and wanted something that just had a sweeping second hand and this will be my daily wear. I was amazed by the knowledge that the WatchBuys staff offered. Matt, Rob, George and Tim you rock! !